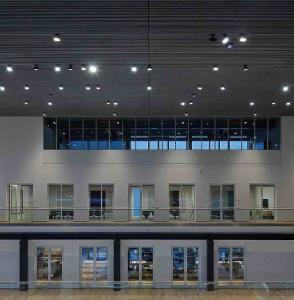 GEZE is expanding the traditional building automation technologies with new, innovative solutions, because heating, air-conditioning, lighting and shade aren’t everything when it comes to 'smart buildings'. A building is really only truly 'smart' when the doors and windows are also automated, and integrated in a building system. GEZE is thus presenting the new BACnet building automation system GEZE Cockpit. It creates unique opportunities for energy-saving and secure and convenient building operation in smart buildings. Automated GEZE products from the fields of door, window and safety technology can be monitored precisely and operated reliably. The system can be used as an independent building automation system, or be integrated into a higher-ranking building control system. GEZE Cockpit takes the complete 'intelligence' of products into the building network: doors and windows can be operated 'intelligently' only with software, because data from other participants and sub-systems can also be used, such as setting the opening width of a door or the opening and closing of a window according to outside temperature in combination with temperature sensors and heating systems. The control unit offers the logical crossroads of GEZE building networking. Various browser-based software applications can be installed on the BACnet building controller, an embedded Linux computer. As a result, any IP-enabled device – be it a PC, tablet or smartphone – can access and action the information from the systems. Interoperability is provided by the most common communication protocol in building automation, i.e. BACnet. The system offers MS/TP interfaces which receive signals from the doors and windows and sends these back to them. The IO 420 BACnet interface module ensures the door and window system components are BUS-enabled. The pre-installed configuration software allows GEZE Cockpit to be integrated into a higher-ranking building management system. 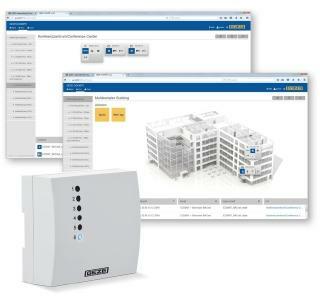 Further software versions enable the solution to be used as a stand-alone building automation system for doors, windows and connected safety technology. For example, the versions enable the localisation and visualisation of all connected doors and windows on one building plan. Furthermore, the current mode of operation and functional capability of the doors and windows can be represented on a graphical surface and the modes changed at the touch of a button. The creation of so-called scenes enables several products to be operated simultaneously – whether at the touch of a button or time-controlled. Individual monitoring functions are equally possible, such as e.g. the evaluation of access frequency and alarms with e-mail reporting. Building managers can control doors and windows without a visual inspection, get information from any location about changes in mode, and alarm or malfunction reports from individual doors or windows, and respond immediately. This may be the case if the emergency push button on an escape door is activated in a retail store, if a door in a care home is opened without authority during the night, or if a door in a public building fails to lock after it is closed in the evening. GEZE Cockpit is also recommended where operating requirements and the protection of automatic doors vary according to the time of day. For example, if multifunctional doors in a retail outlet are operated with different modes of operation ('permanently open', 'automatic', 'shop closing') during the day, and as secure escape and rescue route doors at night, the building manager can also monitor and operate the doors, and change the mode of operation or time-controlled functions from a different outlet. All the processes on a door are traceable and transparent because the results are fed back to an event log. In the new sales building of the crane manufacturer ABUS: the automatic sliding door system in the main entrance and all RWA skylight exhaust air systems can be monitored and operated centrally. They are integrated in the BACnet-based building management system via the IO 420BACnet interface module. 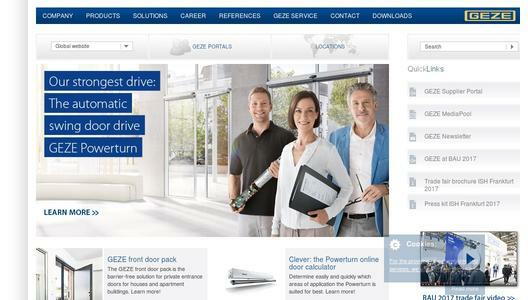 GEZE products can be networked for the automation of many various building functions in the building management system. The IO 420 interface module allows automatic door systems, window technology and smoke and heat extraction systems (RWA), as well as safety technology, to be integrated quickly and easily into network solutions with the BACnet communication standard, and networked with each other over the BACnet MS/TP connection. The IO 420 module enables the central visualisation and control of all automatic door systems via the building management system. 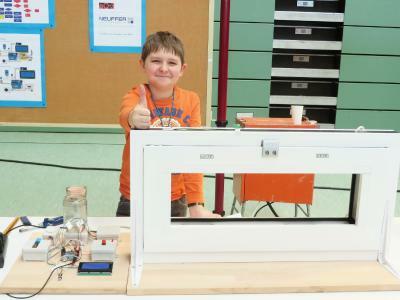 In this way, the mode of operation of doors can be displayed and controlled remotely. Emergency exit protections (RWS) can be released. To open the door in an emergency, the electric locking device and the swing door drive are controlled automatically. In combination with a smoke and heat extraction system (RWA), extensive ventilation scenarios can be realised. The modes of operation of self-locking panic locks can also be invoked and activated. Fire protection doors, which are held open electrically with hold-open systems for barrier-free access or to provide natural ventilation, can be closed from a central point. Remote monitoring and setting of the modes of operation of doors and escape route control units as well as remote control and operation of windows have welcome advantages: they optimise the energy balance sheet, make the work of the building manager easier and increase building safety. Builders and electrical companies as well as installation companies working with automatic doors, hold-open systems, emergency exit protection systems or smoke and heat extraction systems will find a more workable and flexible network solution in IO 420interface module. It extends their range of products and opens up new forward-looking markets. Building operators and facility managers will improve the efficiency of their work with the IO 420 interface module. Remotely monitoring the modes of operation of doors, emergency exit protections and windows connected to smoke and heat extraction systems, as well as remotely setting the mode of operation depending on the situation, optimises the energy balance sheet and increases security. If the components are not in the desired mode, counteractive measures can be implemented immediately via a corresponding control. 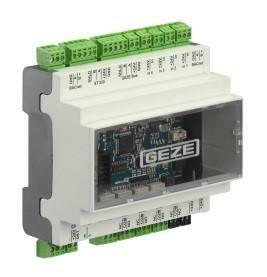 The IO 420 interface module gives planners, manufacturers of building management systems and system integrators the opportunity to extend their product range with GEZE products. These products can be flexibly adapted to the building management system, enabling various GEZE system components to be visualised, monitored and controlled. 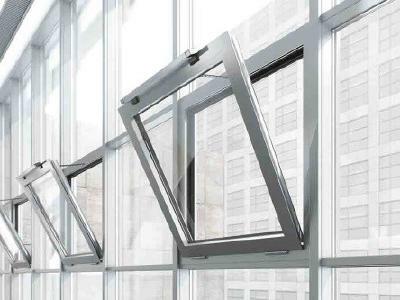 For reliable smoke and heat extraction (RWA) or convenient ventilation: as a system provider and a specialist in customised window technology solutions, GEZE automates window and façade elements of a wide variety of sizes, weights, shapes and opening types. 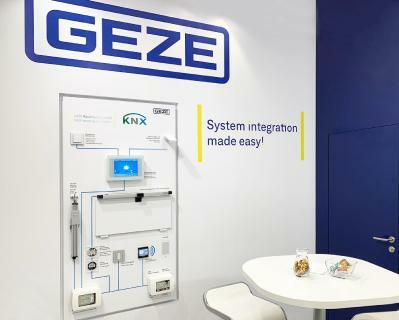 GEZE is presenting complete smoke and heat extraction systems (RWA) with window drives from the 'intelligent' IQ windowdrives series and the modular RWA control unit MBZ 300. Integration into the GEZE Cockpit building automation system or the building management system via the IO 420 BACnet interface module makes the RWA window systems 'smart'. Networked windows ensure a healthy and pleasant indoor climate, optimise the energy balance sheet and increase safety in the building. This enables the status of smoke and heat extraction (RWA) windows to be monitored or smoke and heat extraction ventilation doors to be controlled. 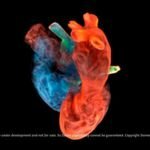 Windows can be controlled with different ventilation scenarios, independently of the temperature, rain/wind or ambient air quality, the time of day or the presence of people. Rooms are cooled automatically at night according to parameters defined in the building management system. The Slimchain and Powerchain chain drives and the E 250 NT spindle drive have flexible uses. They differentiate between alarm (RWA) and ventilation mode, in other words a fast and maximum or slow and limited opening. The adjustable drive stroke and the individually adaptable opening speed enable usage on RWA and ventilation windows of various sizes and with different opening requirements. If an 'RWA event' occurs, the drives can attain very large opening widths in under 60 seconds. With the Power lock locking drive, they form the IQ windowdrives product family with the universal GEZE design. The integrated, intelligent control unit allows drives to be networked easily. It ensures the sequential and safe opening and closing of the windows as well as the synchronisation of up to three drives. 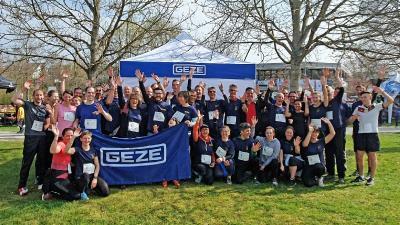 GEZE of course achieves the required protection – depending on the point of installation and usage – by means of sensors or protective strips.